As many students abandon traditional, on-campus university programs to pursue online degrees from the comfort of their homes (myself included), monitoring online exams has become a widely debated topic. While online proctoring has, no doubt, helped to eliminate cheaters, many students believe this technology is far too intrusive and needs better regulation. Completing a subject or an entire degree online usually means you have the choice to undertake your exams online (depending on your institution.) Whilst this may sound like a dream come true to some, many universities have invested heavily in online proctoring technology to rigorously monitor exams… rather than relying on students’ honesty. 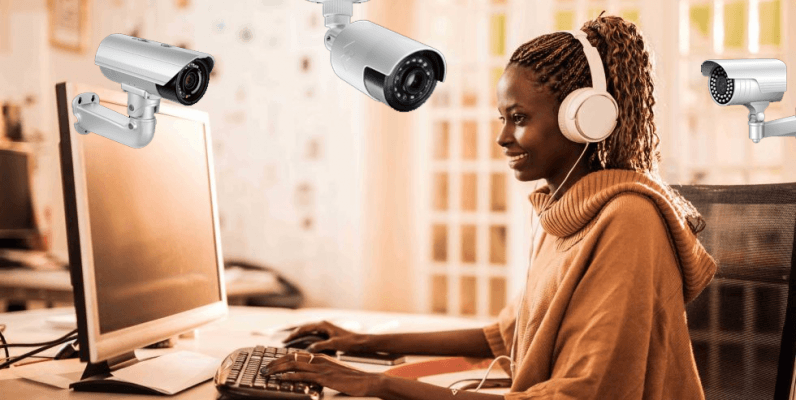 Online proctoring allows students to complete their exams from nearly anywhere; provided they have a webcam, microphone, stable internet connection and a secure work area. The online proctoring process can be live, conducted by a proctor via webcam; or it can be automated – with a computer that tracks and records eye movements, noise, and behavior so examiners can later review the footage (if necessary). US-based proctoring service, ProctorU, is used by nearly 1,000 institutions worldwide – including my university – to monitor online tests. Many test takers have voiced their qualms about the extreme amount of privacy you must sacrifice to use this, or similar services. Amazon has even been accused of violating candidates privacy in the past for using online proctoring services such as ProctorU and Proctorio during their recruitment process. My exam was scheduled at 4.20PM on a Wednesday. After logging into my ProctorU account and starting my session, my webcam automatically activated and I was required to take a photo of my ID. Next, I waited… and waited for a proctor to become available to monitor my exam. Finally, about 15 minutes later, a technician became available and I was prompted to download LogMeInRescue, a program offering ‘remote support,’ which is just another way of saying it gives the proctor full control of my computer. Next, I was asked to show the front of my computer using a reflective surface, like a mirror, to prove I didn’t have notes taped on the front of my screen. I was then asked to provide a 360-degree view of the area I was sitting the exam in, pausing at each corner of the room – followed by giving the proctor a view under the desk and of the floor. Finally, at 4.45PM I was told I could begin my exam. I was asked to log into my university’s platform where I was prompted to enter a password – which only the proctor knew. During the duration of my three hour and ten-minute exam, I was advised I was allowed one five-minute toilet break. I took this break about halfway through and upon returning to my desk the proctor asked me to provide a 360-degree view of my work area… yet again. For myself, and many others alike, completing a degree the traditional way is no longer an option due to full-time work, family commitments or simply the distance from university or the exam center. Whilst being watched and listened to, in my house, for three hours, just after sending a picture of my drivers license with my address on it makes me feel somewhat violated, I don’t really have a choice. There are ways to reduce the intrusiveness of online proctoring, such as using a different user account, entire computer or going somewhere other than your home to complete the exam. However, those are usually the last things on my mind when I am about to sit my exam. There’s no doubt that online proctoring services raise some real concerns about the privacy sacrifice many of us make for the convenience of being able to study online – even if it’s the only way. We all want an even playing field between online and real-life exam scenarios. However, it’s about time some boundaries are put in place across the board before things go too far.